The summer holidays are a source of great love and great loathing for parents. You love seeing their little smiling faces around the house. You love that you don’t miss them when they’re at nursery. You love that there’s so much more opportunity for trips and adorable photo ops. However, one thing no parent loves is the fact that all little ones seem to resemble miniature house-bound hurricanes, and any opportunity for a bit of quiet tidying up, cleaning or laundry-doing is gone with the hours the kids spent making the schoolroom a mess! 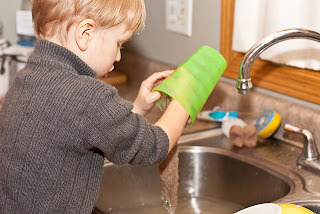 The main problem here is that little ones see summer as free-rein time – no school, no restrictions – which can mean they’re reluctant to help you out with chores, as, Mum, there are so much more exciting things to do! Did you forget that you put the paddling pool up yesterday?! But there is a simple way to get them helping in just three steps! As parents know, your dream of a summer filled with lie-ins now the school run has ceased is a dream destined to go unfulfilled – kids will still be up at 6.45am no matter whether they have school or not, simply as they are in the routine of doing so. Now, this can work to your advantage. As they now have time to spare, try to work a few extra things into their routine. Encourage them to make their bed, take their breakfast bowls to the sink and put their clothes in the wash basket at the end of the day. You might meet some resistance at first, but after a week or so of reminding and encouragement they will do it automatically, as part of their daily routine. For the more boring tasks that are difficult to work into a routine, try making them more fun and appealing by making them into a simple game. For example, sorting laundry can be a great categorising activity – if you have two or more little ones, give them each a basket/pile of laundry and get them to sort it into whites, colours and darks – the quickest wins the game! 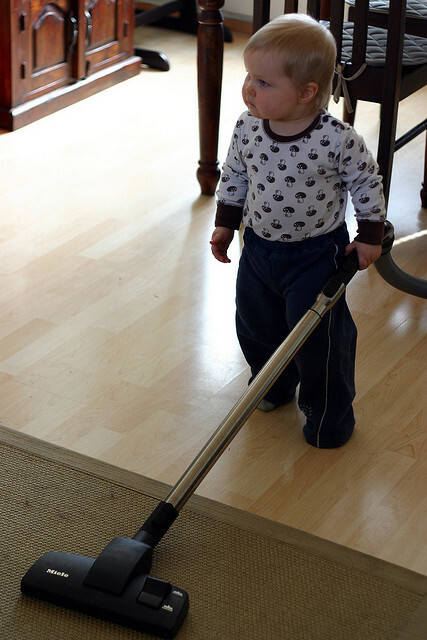 Vacuuming, mopping or dusting can be made fun by making it an assault course (put small toys on the floor for them to navigate) or by hiding a small treat under an item of furniture that can only be recovered by the “Dust-Eating Monster” (aka the hoover/duster/mop). Just keep an eye on them to make sure they don’t cheat! Rewards can be one of the simplest, yet underused or misused ways of encouraging little ones to help around the house. If your child is really unwilling to participate in chores, I would try to resist the urge to reward them with junk food, money or toys for every task, as they’ll come to view a reward as a necessary payment for doing anything – even putting their toys away! Taking a leaf from the school handbook for motivating pupils is a better choice. Little ones are used to getting rewards in schools in the form of star charts, which work great at home too. Make a list of the weekly chores you want them to do over the summer and transfer them onto a big sheet of card, with a “BONUS POINTS” section at the bottom for rewards for things that aren’t on the chart (even more bonus points if they weren’t asked to do it!). If you like, you can have them working towards a small present of their choice – for example, earning 100 stars could earn them a brand new pencil case for the new school year, or a trip to the local water park. The more things they do to help, the quicker they get their reward! Do you have any top tips to add to the three step system? What do you do to encourage your little ones to help out over the summer? I nominated you for a Liebster Award! Check it out on my post!